When Papa’s seven little mouse boys ask for a bedtime story, Papa does even better than that—he tells seven stories, one for each boy! Start with a single rose. Add hollyhocks and marigold, sunflowers and zinnias. Voilà! A quiet, tranquil, beautiful garden grows before your eyes. But who’s that hiding in the corner? Thirty-eight original limericks about all manner of pigs. Ming Lo’s wife is angry. The couple live beside a big mountain which causes them no end of trouble. Shadows fall over their garden. Rocks fall through their roof. And it is always raining. “Husband,” says Ming Lo’s wife, “you must move the mountain so that we may enjoy our house in peace.” But how can a man as small as Ming Lo move something as large as a mountain? Maybe the village wise man can help. This whimsical literary folktale is set in China. A lazy farmer buys some pigs but refuses to do what is needed to care for them. His wife ends up doing all the work. She cleverly puts an end to his laziness. The Great Blueness and Other Predicaments tells the story of a wizard who lived a long time ago, when there were no colors in the world. Everything in the world was black and white and gray. To amuse himself, the wizard mixes some things together and finds some interesting stuff in the bottom of his cauldron. When he names the stuff “blue” and paints his house with it, his neighbors want some. The rest of the story explains what happens after that. 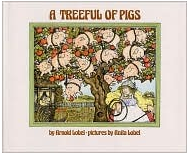 There was no one better at writing books for beginning readers than Arnold Lobel! For over twenty-five years he has made children laugh with his stories about frogs, pigs, mice, elephants, and almost every other animal imaginable. Now, for the first time, three of his very best I Can Read Books are together in one volume. Small Pig runs away from his farm because it is too neat and shiny. He wants lots of good, sticky mud. He tries a swamp, a junkyard, and a big city, without any luck. Where can he find what he is looking for? When seven mouse boys are tucked into bed, they ask their papa for a story. He does better than that – he tells them seven Mouse Tales, one for each of them to fall asleep to. When Mother and Father Elephant are lost at sea, their elephant son is left all alone. But not for long. Uncle Elephant comes to the rescue – full of wrinkles, stories, and just the right song for any occasion. Caldecott Medal winner Arnold Lobel is at his very best in this collection of funny and gentle stories perfect for any child just learning to read.